Show off your royal colors in this beautiful purple inlay barrel racing saddle! This saddle features hand tooled basket weave and floral tooling on medium oil leather that is beautifully accented in a metallic purple hand painted inlay. 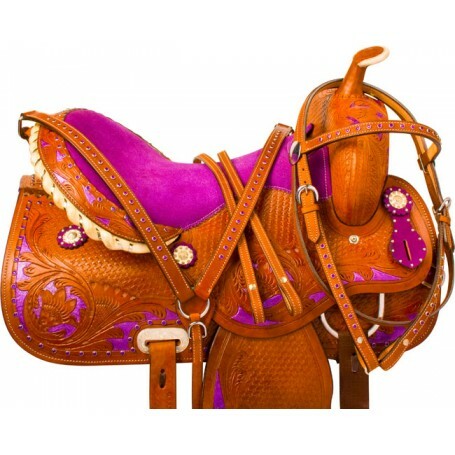 The inlay is accented with purple rhinestone crystal trim throughout the skirt and the cantle of the saddle with a well-padded purple suede seat and shiny silver conchos. The saddle is finished with a rawhide and silver laced trim cantle and features a well-padded fleece underside for horse comfort. For a limited time only, receive a FREE matching headstall, reins, and breast collar while supplies last!